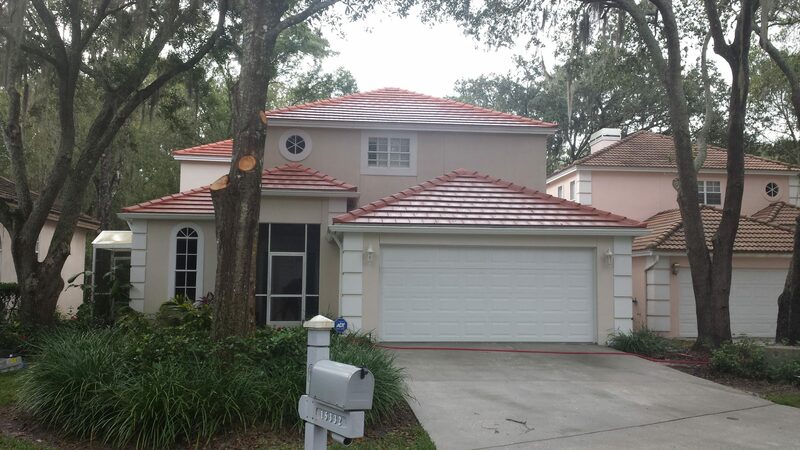 Apple Roof Cleaning Of Tampa (813)655-8777, and our exclusive to us no pressure soft wash roof cleaning process, fully comply with the asphalt shingle and tile roof manufactures guidelines. (A.R.M.A.) We guarantee in writing that our roof cleaner will NOT harm your roof. Our soft wash cleaning solution is made up of algaecides, mildewcides, soaps and water. 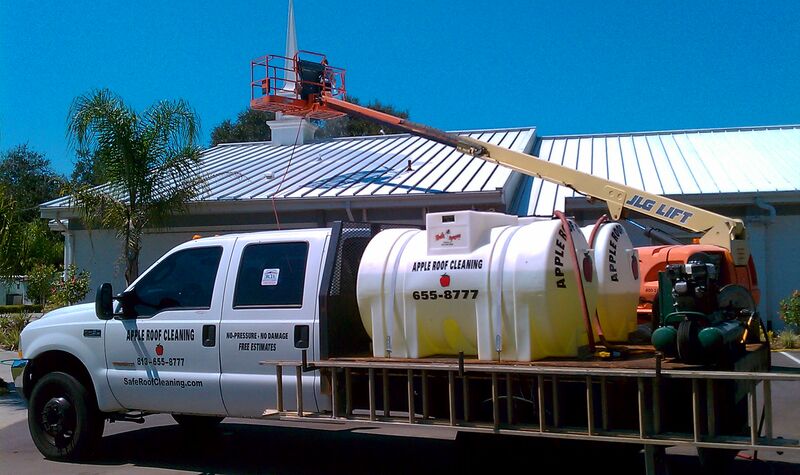 Our soft wash , no pressure, chemical roof cleaning system is the safest and longest lasting for all asphalt shingle, tile and metal roofs in Tampa. The exclusive soft wash system we use and develpoed actually kills and removes the algae, mold and mildew that are discoloring your tile, metal, or shingle roof.Then the exclusive growth retardant roof treatment chemical that only we offer, ensures that your soft wash roof cleaning will stay beautiful for much longer, then roofs cleaned any other way. You can spend more money, but you can not buy better looking, or longer lasting, shingle, metal, or tile roof cleaning in Tampa, then what we have to offer you! We did not win this award below for nothing! Apple Roof Cleaning Of Tampa (813)655-8777 takes great care and all precautions when dealing with your landscaping, home and ourselves. We never work alone; We only work in 2-3 person teams. First person is the “dedicated ground man.” Their job is to continuously water the ground, plants, and home during the entire time. Second person is the one who is fully trained and Certified by the Roof Cleaning Institute Of America to spray the soft wash chemical on the roof, and rinse it when finished. Third person (if needed) is assisting the rinsing of chemicals and grounds on larger jobs. On arrival we do a full walk of the roof and inspect the it for any damage, including excessive loss of granules, tree damage, cracked or missing shingles, cracked pipe jacks, etc. And before any soft wash chemicals are applied we completely water the ground, plants and home. Then we apply an even coat of our soft wash roof cleaner solution. Wait 10-15 minutes to allow the roof cleaner to go to work and break up the algae rooted in the shingles surface. (This is the most important part of the soft wash roof stain removal.) If needed, we will apply a second and even a 3rd coat of our roof cleaner to guarantee your shingles are completely free of the algae so you know you have a clean roof. After the roof cleaner has done its job, we completely rinse everything with a garden hose (no pressure) to remove the algae without doing any damage. We also use a gas string trimmer to trim all of the tall grass. Apple Roof Cleaning Of Tampa (813)655-8777 never ever uses high pressure, or stiff bristle brushes, as this can damage things further. Once the roof is free of algae the protective coat goes to work, these exclusive to us roof treatment chemicals are already mixed in with the cleaner, and start to work immediately. This keeps your roof clean and beautiful, by helping prevent the stains from coming back for many years to come. 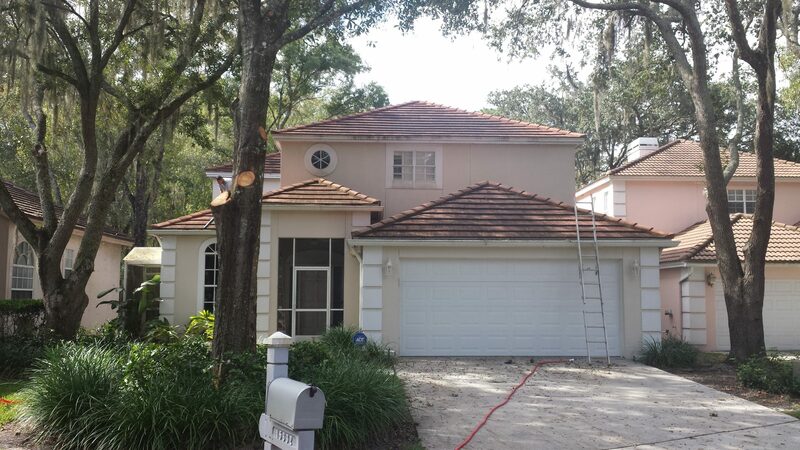 Below are a few examples of some soft wash roof cleanings we have done, here in the Tampa area. Do Algae Resistant Shingles Work ? 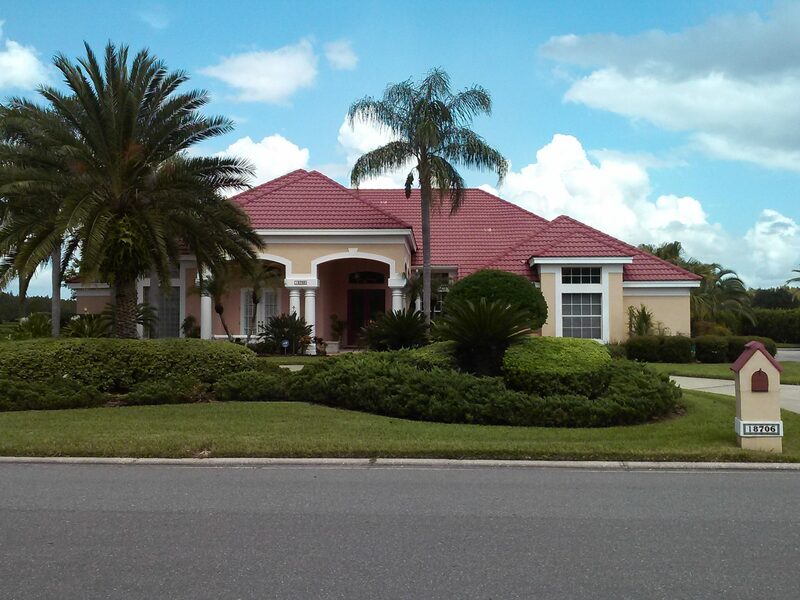 We are often asked by our customers here in Tampa, if Algae Resistant Shingles are effective, in keeping a roof clean. Asphalt Shingles are made Algae Resistant by a patented process developed by the 3M Company. Copper granules are embedded in the shingles. When water from Dew contacts the Copper, it leaches down the roof, slowly killing algae and bacteriological growth, and prevents roof cleaning. This is what is claimed anyway. 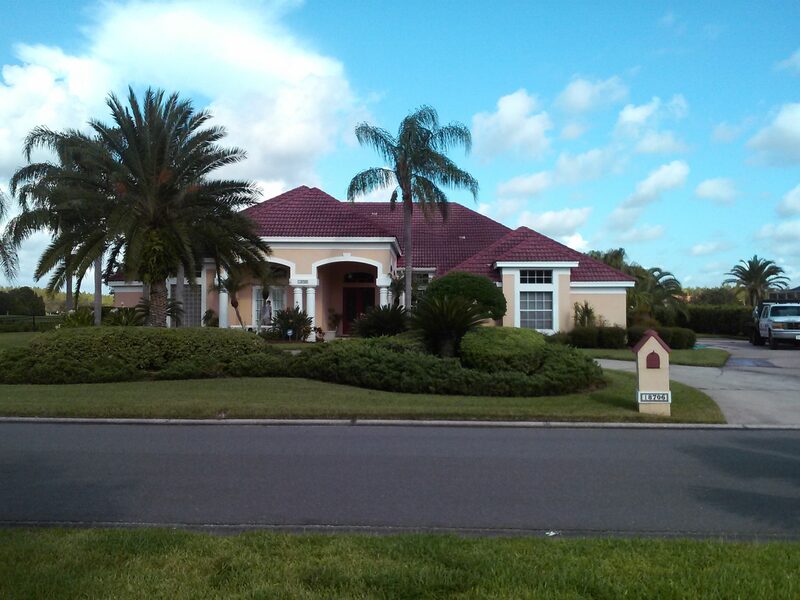 Our experience is this, Algae Resistant Shingles do get dirty (we clean them here in Tampa all the time). However, they do seem to prevent the growth of Algae a few years longer then non algae resistant shingles. Eventually, the heat and humidity here in the Tampa Florida area makes roof cleaning necessary, even for algae resistant roofing shingles. If you have these algae resistant shingles on your roof, we may be able to assist you in getting your roof cleaned under warranty, for FREE !